Engage your young customers by distributing these personalized cube puzzles featuring your brand logo. These custom printed puzzles will not only give amusement but also serve as a valuable stress reliever tool. 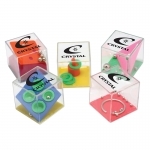 By customizing these cube puzzles with your brand logo and contact information, you are effectively positioning your business in the hands and minds of your potential customers. Not only that these cube puzzles make impressive giveaways but also serve as a fun reminder of your company and its promotional goals. Shop at Promo4kids.com to avail customized puzzles at attractively low wholesale prices! You can save on online design proof, artwork assistance and your efforts to attract customers. Fast production time and fast shipping facilities offered by us will allow you to order these items and stock them for your future distribution. Promotional cube puzzles are one of the best sellers of promotional giveaways for kids because they will keep them busy for hours. Today, marketers understand that kids are the toughest prospects and they should be addressed with care. Most kids remember details of the business that cajoles them and teaches them something new. You can inspire kids to remember your brand logo and other brand details creatively with these custom printed cube puzzles. These puzzle cubes are not only a boredom breaker but also a big stress reliever. 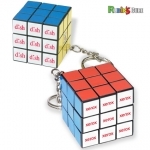 Take advantage of the promotional potential of these customized puzzle cubes during your next campaign. Logo puzzles are perfect to promote your brand on all those occasions when you want to make great impressions on the crowd of potential customers, friends and families. They make one intelligent business gift throughout the year because people cannot resist them. You can either hand them as individual acknowledgment items or as gift basket inserts, mailer campaign giveaways or anything as long as your customers enjoy them. Logo printed cube puzzles are a great hit at conventions, trade shows, road shows, in-store promotions and other marketing events. No matter how you want to incorporate these promotional puzzles in your campaign, you can be sure about the large promotional exposure it offers. Also, you can promote your brand message in an intriguing and playful manner, too. Personalized cube puzzles are perfect to gift during birthday parties, anniversaries and several other individual celebrations such as wedding favors, graduation events, etc. At Promo4kids.com, we offer a vast selection of promotional puzzles in different designs, colors and prices. You can easily make the choice depending on your promotional requirements and budgets. We are sure that with so many puzzles to select from you may get confused about the right choice for your target audience and promotional requirement. Our customer service experts will help you in the right selection, order and customization related doubts. You can avail their services by calling us at 855-454-3786 from Monday through Friday (8 AM - 6 PM EST). Alternatively, you can write to us at info@promo4kids.com.